Photocopiers are obviously one of the essential office machinery today, and it is sure to carry a workload every day that can be tedious to the core. As such it is but natural that even the best of the machine will need to be serviced periodically to provide optimal result. There are free service periods, warranty period that are offered by the respective companies to keep the machine in good conditions. When you buy the photocopiers, you must go through the product warranty, and carry on the repairing and maintenance services from that company only. You can also contact local dealers, who deal with photocopier service and repair maintenance. It is advantageous to have a maintenance contract for your photocopier, as the machines are expensive and a serious breakdown can be a costly affair to handle. A contract with a third party repair agent that is pre-arranged for the month with the agreed fee is a good decision. The fee can also be based on the volume that your machine uses. Since you know the volume that your office deals with, you will be able to choose the better option. In case you have a personally owned photocopier and rent it out for commercial purposes, in most then you must go for an ongoing service providing arrangement. In such cases, it is good to verify every detail of the contract before signing it. 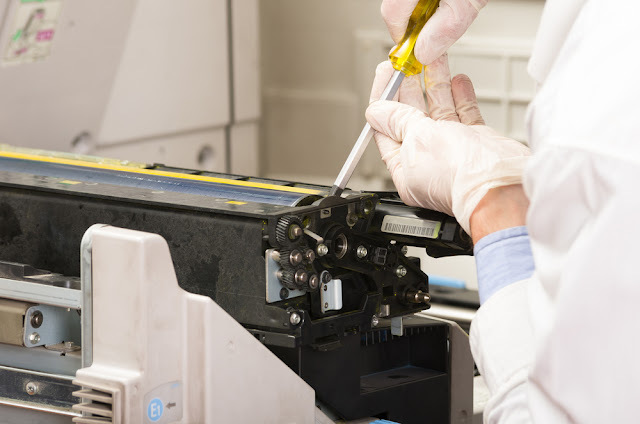 Along with the time duration, the photocopier service and repair maintenance professionals must also tell you about the part replacements and how will they carry on the technique of repairing. Also, there should be clear terms on what services are covered by the monthly fee that you pay and if it covers all the costs of the part replacement as well as that of the technician. These contracts are valid for the regular supply of the toner, ink and any other consumable. In such cases, the contract should clearly specify the rates at which they will be supplied, and what will be cost incurred of replacing parts. You will, however, find maintenance and repair personnel that charge only a fixed price for any type of repair work. You must also inquire abut any additional charge, if it applies to your photocopier. On an average, the Photocopier Service and repair agents offer different prices and plans for the contract. These plans can range from anywhere between monthly fees, copy limits, to the higher cost incurred per page printed in excess to the stipulated numbers. This usually happens because there are machines that have different types of use at home, office or in the commercial sectors. The other viable option is to pay as you go plan in which you call the technicians only when required. In such cases, the fee is deemed to be higher than the regular contract. Also, the repair costs are likely to be more than the maintenance contract repair. Most Photocopier Service and repair companies are however a responsible lot, offering prompt service to their regular clients. The helpline that they provide will reach you directly to the personnel who will be able to respond in quality time of four to eight hours. For offices and large establishments, the reputed companies also have the provision of giving a photocopier on loan in case the machine cannot be repaired on site, and they have to carry to their premises for some time. If you go for bulk orders for repairing parts or the whole of the copier or the printer, then it is better to afford an annual maintenance service plan that will include the service and repairing of major parts. For more information about services, click the link and get more details.